Most LED lights on the market use lenses, and a lot of the sellers spend a lot of time talking up their particular lenses. As I&apos;ve learned more about LEDs, it&apos;s become clear that there are 2 different kinds of lenses: Primary and Secondary. 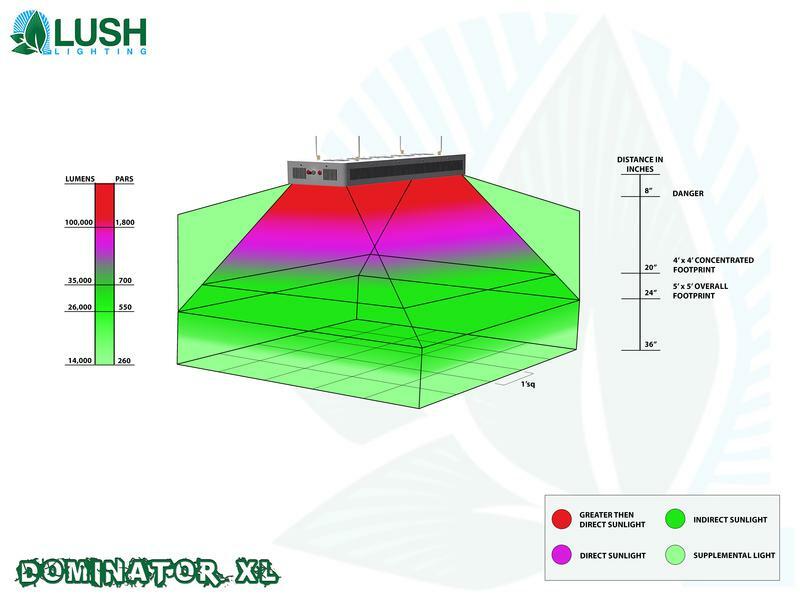 For LED grow lights, it&apos;s my understanding (as detailed below) that the best lights will use primary lenses, ideally will not use secondary lenses, and that using reflectors isn&apos;t as efficient as using secondary lenses (this applies only to LEDs– not other grow light technologies). Companies that use primary lenses only were put in the "Good" category above; companies that use secondary lenses or reflectors were put in the "Questionable" category, and companies that don&apos;t use primary lenses or lied about what their secondary lenses or reflectors do were put in the "Bad" category. You can see all of the lens and reflector data for each model light in the table at the bottom of this page. Primary lenses are placed directly on the light-emitting portion of the LED, because they increase the efficiency of getting light out of the silicon. Even though lenses always lose some light, the extra light primary lenses harvest from the silicon is more than this loss. So basically, if you don&apos;t have a primary lens, more of the light you&apos;re paying to create is just trapped bouncing around inside the LED and never gets to your plants. Almost all LED grow lights use primary lenses for this reason– it is just more efficient, and it costs almost nothing to add a primary lens. There are a couple notable exceptions: both Area 51&apos;s models and Hydro Grow&apos;s Sol lights don&apos;t use primary lenses, and I can only guess at the reason why. It can&apos;t be just because these are both "COB" LEDs, as there are other COB LEDs with primary lenses, though they all seem to be a much lower-wattage COB. My guess is that these higher-power COBs are already running so close to a damaging overheating threshold that the addition of even a little plastic would overheat them, but I&apos;m just guessing based on what I&apos;ve read here. Whatever the reason, buying an LED grow light without primary lenses seems like a bad idea. Secondary lenses are placed beneath the primary lens to focus the light into a wider, or more frequently, narrower beam. It is important to understand that secondary lenses (sometimes called "optics" in marketing material) do NOT increase the amount of light, they just change how it spreads out. In fact, secondary lenses decrease the total amount of light that gets to your plants because some of the light is reflected off the lens and some is absorbed by the lens. The amount of light lost depends on the exact lens, but 8%-15% loss is pretty standard. There are reasons you may want secondary lenses for lower-powered LEDs; they focus the light to make it more intense. But just like adjustable-beam flashlights, when you focus the light into a tight beam to make it more intense, the total coverage area drops. A seller can increase some PAR measurements with secondary lenses too, but this isn&apos;t necessarily a good thing– see my dissection of a PAR deception for a full rundown. It seems to me that you only really need secondary lenses if the light isn&apos;t intense enough in the first place. Indeed almost all of the lights I compare that use secondary lenses are using 1W or 3W LEDs, or a mix of 3W and 5W LEDs– though I can&apos;t tell if the 5W chips also have secondary lenses or not, or even if the 5W LEDs are being run at anything close to their full potential. From my personal experience, I can say that an all-3W LED panel without secondary lenses didn&apos;t penetrate plant canopies very well but had a decent growing footprint–perfect for a sea-of-green (SOG) or screen-of-green (SCROG) type grow. An all-3W LED panel with secondary lenses did penetrate the canopy much better and worked better with taller plants, but it had a much smaller footprint. Basically, I&apos;m not a fan of secondary lenses because of the reduced footprint, reduced efficiency, my feeling that they are most often added for deceptive purposes, and because they just aren&apos;t necessary if your LED grow light is bright enough to begin with. Some companies are lying about what their secondary lenses can do and that&apos;s just wrong. Traditional incandescent, fluorescent, induction, plasma and HID light bulbs put out light in all directions (360 degrees around the bulb), so they need reflectors to bounce half of their light back down to your plants. LEDs only put out light in 180 degrees or less, so they don&apos;t need reflectors because they aren&apos;t aiming light at the ceiling to begin with. Since the efficiency of LEDs is increased by putting a primary lens on the chip, as discussed above, the lens can be used to focus the light more down toward your plants so it isn&apos;t illuminating the walls out to the sides, and there is no need for a reflector to do that task. Just like lenses, reflectors aren&apos;t perfect at redirecting light, and they cause about 10%-20% of the light to be lost. However, reflectors degrade over time as they oxidize and lose efficiency; this is why some HID hood manufacturers and experienced HID growers recommend getting new reflectors every year. Since LEDs can use lenses that don&apos;t degrade in this way and get more light out of the LED to begin with, it never makes sense to use a reflector with an LED grow light. I would not recommend purchasing any LED light that incorporates a reflector, as it means the designer didn&apos;t understand how to make the most efficient long-term use of LEDs. The models mentioned above that don&apos;t use primary lenses do use reflectors to try and salvage some of the misdirected light. So, they start out wasting light by not using a primary lens, and over time as the reflectors degrade they waste even more. A lose-lose situation. Kessil is the only company compared here that uses both reflectors and primary lenses, and this makes no sense to me. If they wanted to change the way their light spreads, they would be better off adjusting the angle of their primary lens so they don&apos;t waste light in the reflector. If they wanted a really narrow beam angle, they would be better off using secondary lenses than a reflector. Note: I&apos;m only talking about reflective surfaces on the light itself; it usually makes sense to surround your grow with reflective walls to salvage as much light as possible and get it back to your plants. Flat white surfaces (such as flat white paint) work best for this, and white in general (even glossy) works better than mylar or mirrors–it actually reflects more light. Some LED sellers are just blatantly lying about the function of their secondary lenses or reflectors. For secondary lenses they claim an increase total power output without additional electricity, or that they increase light intensity while maintaining the same or larger coverage area. The only way to make light from an LED more intense is to focus it into a narrower beam, decreasing the coverage area. You can pull the light up higher to make it cover a larger area, but the inverse square law of light dictates that increasing the coverage decreases the intensity. If it were really possible to increase the total power output of the light without using more energy, or to maintain the same intensity (power) over a larger footprint and violate the inverse square law of light, these companies would be stupid to focus on the LED grow light industry– they could quickly become billionaires in the energy industry instead. If these claims were possible, you could harvest energy for free by putting a solar panel underneath and sending the power back in to multiply under the lights, creating a perpetual motion machine. Your house, your car, even the grow lights themselves could just be powered by one of these magic energy-multiplying LED lights–just plug it in to get started and then you&apos;d never need to pay the power company again! Hydro Grow describes their X-Pro series: Our secondary lens technology collects and refocuses the light that the primary lenses missed and re-emits it to your plant canopy. The X2 lens has a 25% increase in performance, compared to the previous X1 lens, making it 5.7x as intense as the market standard 90 degree lense. Even better, our optics grade secondary lenses eliminates the use of glass on each unit, preventing potential shattered glass while at the same time creating a larger coverage area. You just can&apos;t increase the intensity and create a larger coverage area at the same time. Additionally, any light the primary lenses "missed" is lost forever inside the silicon of the LED. The advertised footprints sizes for the lensed ("2X") and un-lensed models are exactly the same, except the lensed Vegetator 2X model has a 5&apos;x5&apos; footprint, whereas the un-lensed Vegetator has a 4&apos;x4&apos; footprint–they actually claim the lenses making their light beams narrower are increasing the footprint size! They even have fancy diagrams showing the lensed models having more intensity over the same footprint as the un-lensed models. These diagrams also misrepresent how the light spreads; you can&apos;t get a square footprint out of their rectangular light–2 lies in 1 picture! Spectrum King claims that their lights&apos; reflectors make 100% of original LED lumens go directly to your canopy. No reflector is 100% efficient! Bright Light LED (the parent company of Spectrum King) tells the truth about their reflectors on their website page for the exact same light fixture, saying that the reflective rate could reach up to 92%, but they lie about this on the Spectrum King website. The Spectrum King page also states that for HPS bulbs light reflects in hood so only 50% of original lumens make it to your canopy which is also a lie; hoods are designed with reflective surfaces, and while they aren&apos;t perfect, a lot more than 50% of the bulb&apos;s light output makes it to your plants. This isn&apos;t the only time they exaggerate their lights&apos; features and exaggerate HPS bulbs&apos; failures; it sure seems like they are trying to compensate for their lights being inadequate. The primary lens is part of the packaging of the LED itself; I believe it has to be bonded to the LED die to work efficiently, so it isn’t something you can add later. You can get secondary lenses for LEDs but which one you need depends on exactly which LEDs you have. Your best bet is to check the LED manufacturer’s website.